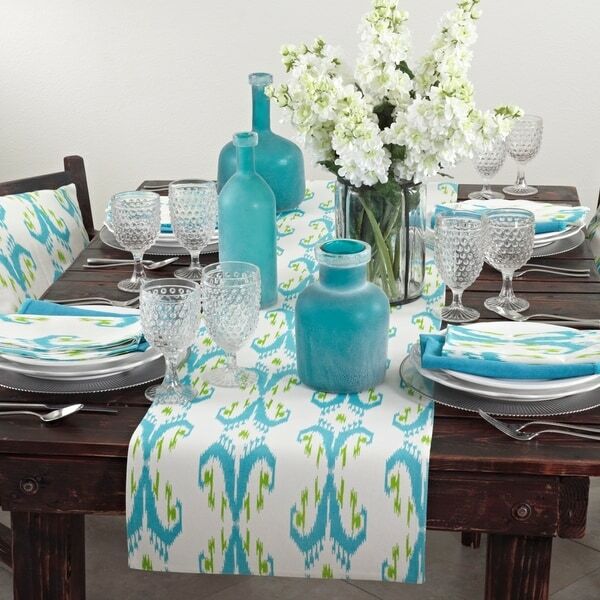 Table cloth looks great and fits my table perfectly I gave it four stars because it gets extremely wrinkly when washed it requires an iron after every wash.
Beautiful bold print adds the pop of color I was looking for in my eat in kitchen. The table runner is durable and of great quality. Good heavy duty table runner, was hoping to get the entire set but in the thanksgiving rush didn't pay attention to the little word "or" in the description. May have to go in and get the napkins and placemats at a later time and date. I used this linen on my glass kitchen table for staging while selling my home. The runner matched perfectly with the turquoise theme of the room. The linen really dressed up the table and I put a vase and candles on it for a complete look. The listing agent really liked it. This is very pretty. Looks just like picture. My table was long. I ordered two runners. Package was fine. Just like it's pictured. Goes well with most spring and summer decor. Looks lovely on my table. true to color shown I love it! "Is the background on this print white or off white?" Hello feralqueen1, the background color appears to be white in my opinion. We try to represent the colors of our products accurately. Unfortunately, due to the difference in monitor colors we cannot guarantee that the color will match exactly what you see on your screen. Thank you for shopping with us. The background is off white.